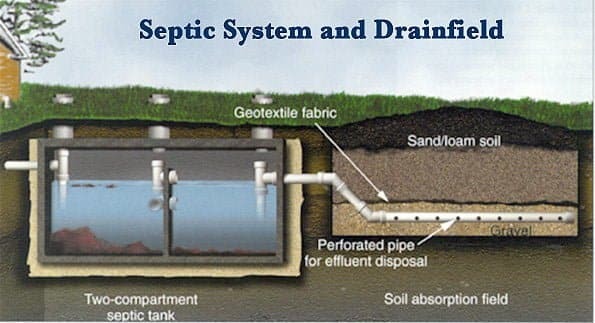 Need septic tank replacement in NJ? Call our expert plumbers at A1 Sewer & Drain Services for great prices and quality service, at 201-645-0888. In rural and semi-rural areas of New Jersey, municipal sewer main lines aren’t always available near businesses and residential properties. Septic systems provide a small-scale, on-site sewage processing and disposal option. 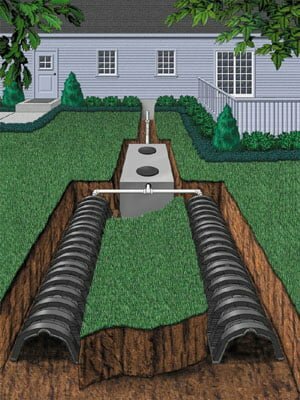 Instead of household pipes and drains emptying into a sewer lateral that feeds into a sewer main beneath the street, pipes from the house connect with a septic tank. In turn, the septic tank has outlet pipes that empty into a drainfield. 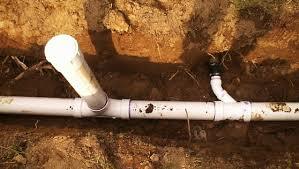 Septic tanks and septic system pipes can be subject to breakage, corrosion, and other problems. These parts have a finite lifespan, and eventually, you’ll need septic tank replacement or septic pipe replacement, many homes opt to convert from septic to sewer in nj if they can. When that time comes, call us any time at A1 Sewer & Drain Services for great service from experienced local sewer plumbers, at 201-645-0888. How Long Until You’ll Need Septic System Replacement in nj? Septic systems are composed of a series of different components, all of which have long but ultimately finite service lives. Good maintenance and timely septic system repair will help ensure that the components last as long as possible with minimal problems. Septic tank pumping frequency. Solid waste materials from septic tanks need to be pumped out periodically. If you don’t pump it frequently enough, it could cause your drainfield to fail. If you pump it too often, it doesn’t have much effect, and you’re essentially wasting money. 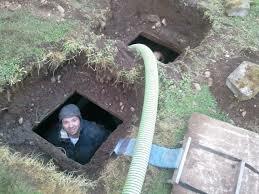 The ideal pumping frequency depends on the size of the septic tank, as well as the number of people in your household. For example, a 500-gallon septic tank in a household with one person may need to be pumped about every five years, whereas a 2500-gallon tank in a one-person household may only need to be pumped once every 30 years. 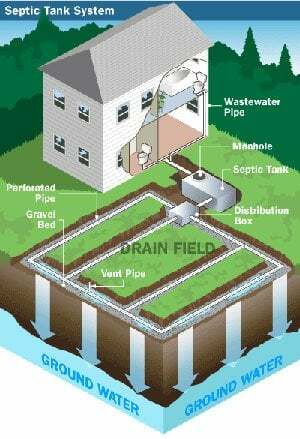 How the septic system is used. Taking steps to conserve water can help reduce the load on the drainfield, preventing early failure and the need for septic system replacement. You should also avoid flushing caustic chemicals or materials that won’t biodegrade easily, like kitchen grease. Soil conditions. The local soil percolation rate and amount of groundwater can impact how long the drainfield will last. Septic tank materials. Septic tanks can be made from several different materials. Steel septic tanks will eventually rust away at the sides and bottom, which leads to clogging in the drainfield. The soil conditions and soil acidity in the area can impact how quickly the rust will form. Concrete septic tanks are longer lived, lasting in excess of 40 years. Lifespan of other components. You may need septic system replacement services for components like effluent pumps, septic grinder pumps, and sand bed filter systems. Trees and plants. Nearby tree roots can invade the septic system pipes, destroying them and leading to the need for septic system pipe replacement. Overall, a concrete septic tank and drainfield– the core components of a septic system– can last for decades before you’ll need septic system replacement from a local plumbing company. These steps can help you prolong the life of your septic system as long as possible, preventing the need for premature septic tank replacement or drainfield replacement. Have your septic system inspected at least once every three years. Regular inspection helps contractors find minor problems early, reducing repair costs and preventing the tank or drainfield from failing. Don’t dispose of hazardous household waste in drains or toilets. Drain cleaners and other caustic materials can speed up septic tank corrosion and pipe corrosion. Use water efficiently. The less water you use, the more you’ll reduce the load on your drainfield, prolonging its service life. Plant only grass over the septic system. Trees and woody shrubs have roots that can invade the pipes. Keep vehicles and livestock off of the area. The weight from cars, trucks, and even large livestock animals can damage the septic tank or drainfield. If you currently have a septic system in your nj home, you may be wondering if you could switch to a sewer system and connect to the public sewer line. If you live in a somewhat remote part of new jersey, you might not have a sewer line close enough to connect to so you have no choice but to have a septic tank system. However, things may have changed in your neighborhood since you had a septic tank installed many years ago. After several years, your region may have been built up more and usually city planners require builders to lay down sewer lines for newer developments. 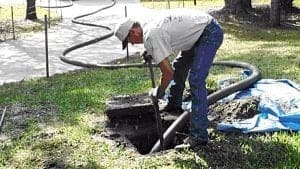 If there is now a sewer line on your street or very near your nj home, you may be able to connect to that sewer line and switch from septic tank to sewer connection in new jersey. If you’re having problems with your septic tank or drainfield, call us any time at A1 Sewer & Drain Services for septic tank repairs, septic tank pipe repairs, septic tank replacement and switching from septic to sewer in NJ. Call our expert NJ plumbers at A1 Sewer & Drain Services for great prices and quality service!